On 14th December, WWE aired its 278th Episode of NXT, filmed at Full Sail University in Winter Gardens, FL on 29th November. 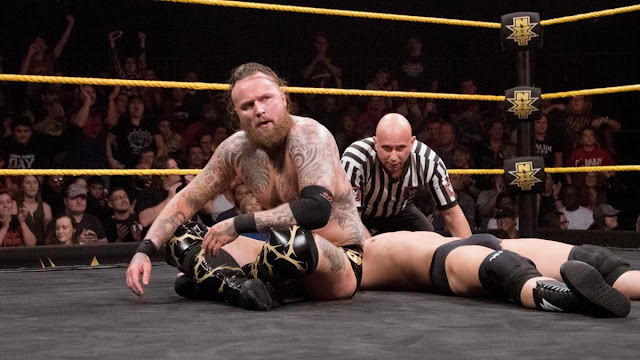 The main event of the show once again saw Pro Wrestling Guerilla's slow invasion of NXT as Adam Cole took on Aleister Black for the third spot in the Number One Contender's Fatal Four-Way. The card also featured Women's Champion Ember Moon fighting one half of the Iconic Duo, Peyton Royce, the former Tag Team Champions Authors of Pain taking on the newly formed duo of Danny Burch and Oney Lorcan and current NXT Champion Andrade Almas against Fabian Aichner. But was it any good? 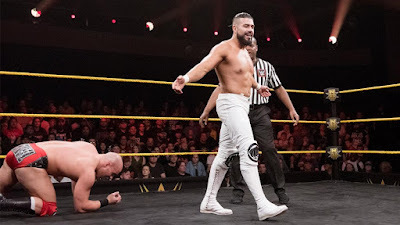 Almas is straight in with a dropkick, he taunts the crowd who are fully against him, it's almost like you're meant to boo the heels, he walks round into a tilt-a-whirl backbreaker from Aichner, Almas rolls out of the ring, Aichner follows with a springboard sommersault plancha, rolls Almas back in and hits a springboard tornado DDT for a 2, he stomps Almas in the corner till Almas slaps his way out, he runs the ropes but is caught by Aichner, he manages to elbow out but Aichner gets a kick to the gut and a powerbomb for a 2, he climbs to the second rope for a moonsault but is distracted by Vega, ALmas pushes him out of the ring, throws him into the steel steps, rolls him back in and hits the Hammerlock DDT for the pin. Considering how little time they were given, there was a lot of content here with Aichner once again impressing with his big lad flippy stuff, expect to see more things from him in 2018 as he's too good for NXT to waste. Almas looked every inch the champion here, he won with some help from Vega but he really brings his all to these matches looking as good as anyone can. A thing you're going to hear me write a lot there though, it could have done with more time to really take it to the next level. Ahead of tonight's main event, we get an Aleister Black package. SaNItY have promo time ahead of next week's title match. Eric Young talks of restless nights & unfinished business, how WarGames was beautiful but the outcome was not ideal, though sanity have not left the battlefield and next week, they will finish what they started. Then there's some crazy laughing and stuff. Akam and Burch start as Burch prepares to grapple but Akam just pushes him to the corner, Burch uppercuts his way out, Akam pushes him to his corner and Lorcan blind tags as the former CZW Champion comes in and lights up Akam with chops, in comes Rezar but both men get slapped to f*ck by Lorcan, in the centre of the ring, Burch and Lorcan work synchronised running corner chops till a double shoulder tackle from Authors of Pain gets them control, a corner death valley driver, a Super Collider double powerbomb and The Last Chapter clothesline-leg sweep combo finishes off Lorcan for the pin. This was quick and brutal doing the job of rehabbing AoP in the wake of their loss (though they didn't take the pin) at WarGames. I would have liked more as there were glimpses of what could have been a much better match here. If they actually do another Dusty Classic, I can see Lorcan & Burch having a good run. 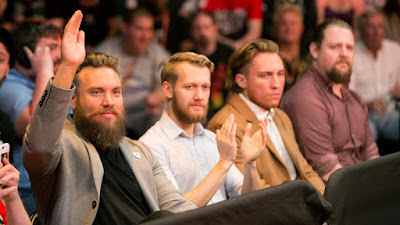 We get a recap package from NXT TakeOver: Chicago of Tyler Bate v Pete Dunne II. Next week: Their third televised singles match in WWE as Tyler gets his rematch. Lock-up to begin and Royce takes down Moon with knees and kicks her on the floor, on her knees and Moon hits a forearm but a kick by Royce, Moon powers out and springboards over Royce, she goes for a roundhouse but Royce catches, she goes for a kick of her own but Moon hits a low rana sending Royce out of the ring, while she recuperates with Kay, Moon hits a plancha onto both women, Moon rolls Royce back in and goes to follow but Kay holds onto her leg till she gets kicked away but it allows Royce a chance to hit a 619 to the back of Moon and lock in a tarantula to send us to the break, back from the break and Royce is maintaining a headlock and hits a low kick on Moon, 'I hate you' says Peyton as she takes a spinning back kick and an enziguri for a 2, back up and Royce rolls up Moon for a 2, a big slap from Moon who goes for a double underhook but Royce escapes, Royce whips Moon to the ropes and on the rebound hits a big striking combination for a 2, she picks up Moon for the Uooohhh bridging suplex but Moon powers to the corner, Royce manages to slip out, posting Moon and clubbing her back, Moon fights back, picking up Royce for a Liger bomb but Royce clings to the ropes, Moon slides out, kicks out the legs, hitting the double stomp and heads back up, hitting the Eclipse twisting top-rope stunner for the pin. As with the past two matches, there was never any doubt that the champ was taking home a victory here but with such a quick match, it didn't really need to sell that story. What matters here is that both performers had a good showing with Royce continuing to be one of the more underrated in-ring performers on any WWE roster. As always with a loss for the Duo I ask, where do they go from here? After the Aleister Black package earlier, we get the contractually mandated package for Adam Cole as well. So you know that mysterious figure last week that we all said was Shayna Baszler? It was Shayna Baszler. She works the scary biker look better than Triple H ever did. Next week: As well as Dunne v Bate III, The Undisputed Era vs SaNItY with the Tag Titles on the line. The last time these two men met one-on-one was at Fight Club: Pro International Tekkers in 2014 when Black defeated Cole but also Black was responsible for defeating both of Cole's stablemates, Kyle O'Reilly and Bobby Fish, in their respective NXT TV debuts, the two lock-up to start as Black transitions to a wristlock, Cole tries to get a sidelock headlock but Black goes to a leglock, they break and go for a second lock-up as Cole gets a snapmare before throwing some taunting slaps at Black's had and going for a taunting 'baybay', he grabs Black into a headlock but Black just tosses him aside, grabbing his arm and while hes in close, laying in knees to the gut and muay thai strikes sending Cole out of the ring before full lotussing into the ad break, back from the break and Cole has Black caught in a crossface but after a while, Black makes it to the ropes as Black breaks just before the count of 5, he stomps out Black, telling him to stay down and asking him if he knows who he is? He's 'Adam Cole BayBay', this was a mistake as we all know Black hates people saying their names and he's up and hits all the different kicks, strikes and knees, in the corner he hits a running forearm and a standing straight leg moonsault, goes for Black Mass but Cole rolls out of the ring, Black goes to the ropes but Cole catches him on them before climbing up top, going for a diving double axe handle Black responds with a roundhouse for a 2, Black lifts his head up with his foot but Cole hits an enziguri and a backstabber for a 2, in a fireman's carry, Black escapes and hits a kick to which Cole responds with a forearm, they trade strikes and Cole hits a big boot and a SUPERKICK but Blac gets a roll-up for a 2, Cole hits the Last Shot for a 2.5, goes for a superkick but caught with a high knee from Black, Cole taunts him, asks him to show him what he's got, turns out what he's got is a Black Mass for the pin. Another good match that felt a few minutes off being very good. Cole and Black have complimentary styles and manages to work well, transitioning from technical to power moves to just striking the hell out of each other at a moment's notice. I would have liked if the crowd could have been a little less behind Cole as it never felt like he was given a chance to even play the heel. It may have been that coming just a week off the potential modern classic that was Gargano v Ohno that this really had no chance unless it topped that match but this still had enough to make it worth a watch. See the inspiring ascent to the title of Ember Moon. It's inspiring, are you inspired? I am. Every hot streak has to cool off eventually. Whenever NXT tries to do their four or five match shows, it never fully works as with only an hour of full air time including ads, they packed all four matches into less than 20 minutes of that run time so no one match really had the time to impress. Not a bad hour of TV, not a great one either but it was good enough. Though next week with two title matches should be a corker.